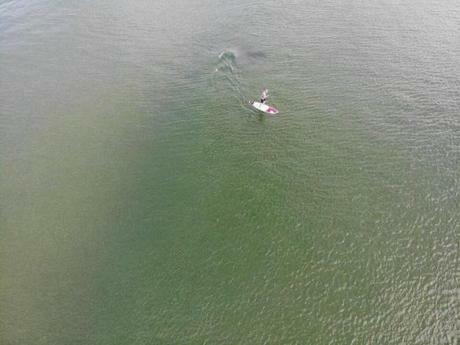 A photograph taken with a drone off the Nauset shoreline on Sunday captured the silhouette of a great white shark cruising by an unsuspecting paddleboarder. Roger Freeman is glad he was able to get breakfast Sunday morning — rather than become one for a great white shark. 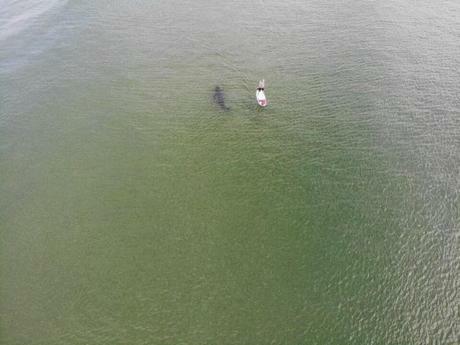 A pair of photographs taken by a drone off the Nauset Beach shoreline last weekend captured the silhouette of a large great white approaching — and then gracefully swimming past — an unsuspecting Freeman as he cruised along on his stand-up paddleboard. The Hingham resident had been enjoying his last day on Cape Cod with his family when he decided to take out his paddleboard early that morning. But when he returned to the beach, he was approached by a surf instructor who was a friend of the drone’s operator, Cody DeGroff. 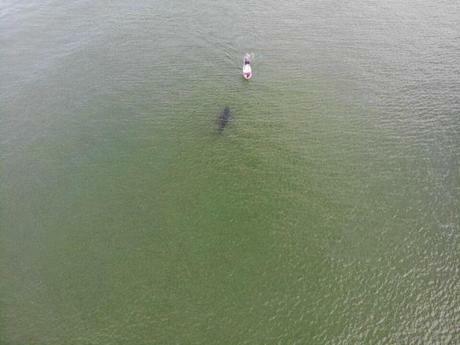 The person said DeGroff had taken a series of images that showed Freeman on his paddleboard as the shadow of a great white passed nearby. When the instructor showed him one of the pictures on Instagram, Freeman was at first amazed — and then it hit him. Freeman later connected with DeGroff and saw additional photos. In an e-mail to the Globe, DeGroff, who is also a lifeguard, said it was his first real flight with the drone. He had been using the device to search for good sandbars because he’s a surf photographer, he said. But then, the shark swam into his frame. “That’s when I started taking all those pictures,” he said. DeGroff said the sighting happened before lifeguards were on duty, but he let them know about the predator once they got onto the beach. The photographs were posted to the Atlantic White Shark Conservancy’s Facebook page Monday, where they were shared more than 1,500 times. “Close encounter of a peaceful kind,” wrote the conservancy, a nonprofit. 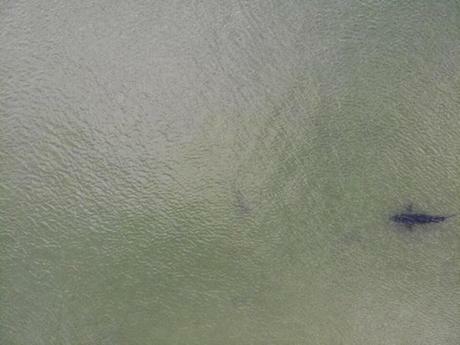 Conservancy officials said the drone photos of the shark — which appears to be longer than the paddleboard — were taken just north of the Nauset public beach. It’s been a busy season in terms of great white shark sightings off Cape Cod — and an exciting one for the conservancy, which is in the final year of a five-year study of the regional shark population with state biologists. On Monday, conservancy officials and state shark expert Greg Skomal successfully tagged the fifth great white shark of the 2018 research season. The tagging came the same day as several reported great white sightings near Truro and Provincetown. 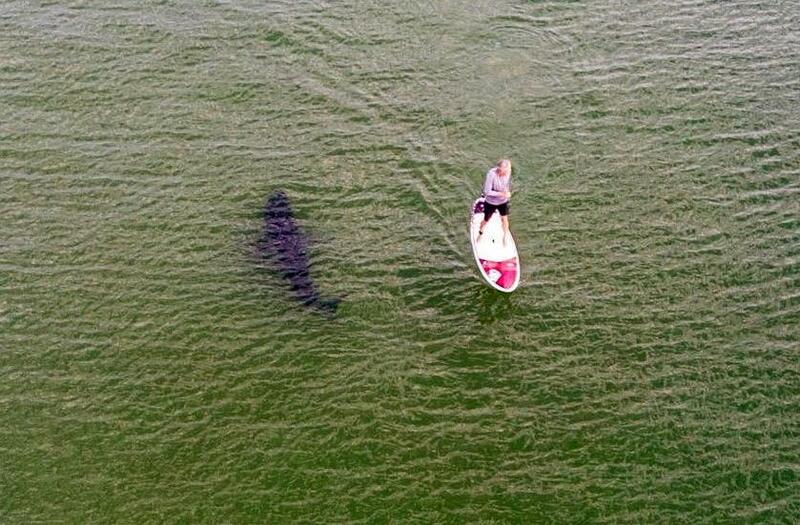 Sunday wasn’t the first time a paddleboarder has had such a close encounter with one of the predators. A recent incident didn’t end as peacefully. Last summer, in August, Cleveland Bigelow III was about to stand up on his paddleboard while approximately 30 yards from Marconi Beach in Wellfleet. Then the shark struck, biting down into his board. 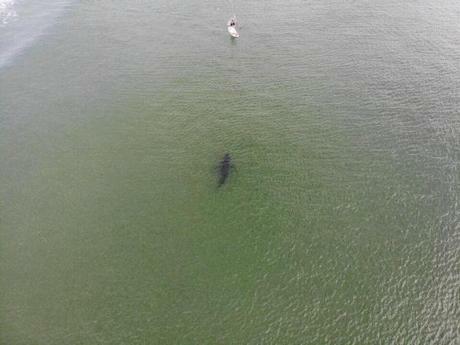 The 69-year-old retiree was able to safely paddle to shore — unscathed — and warn others about the nearby predator. He said with so many shark sightings, some people might think it’s “kind of crazy” to be surfing or paddleboarding off Cape Cod.